EastEnders legend Dame Barbara Windsor has retired from public life after being diagnosed with Alzheimer's. The 80-year-old star of the Carry On films was diagnosed in 2014, and has spent the last four years being privately treated for the chronic neurodegenerative disease, reports The Sun. Her husband Scott Mitchell has come forward to share her diagnosis with the public now because he says the memory loss associated with Alzheimer's has progressed significantly over the last several weeks. "Firstly, I hope speaking out will help other families dealing with loved ones who have this cruel disease," Scott said. "Secondly, I want the public to know because they are naturally very drawn to Barb­ara and she loves talking to them. "So rather than me living in fear she might get confused or upset, they'll know that if her behaviour seems strange, it's due to Alzhei­mer's and accept it for what it is." Scott first urged his wife to see her doctor for forgetfulness back in 2012, and her condition was monitored until a brain scan and lumbar puncture confirmed her Alzheimer's diagnosis two years later. 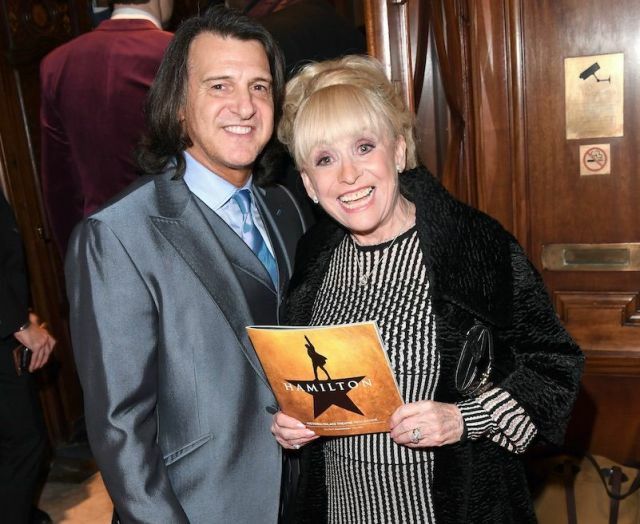 It was shortly after this that Scott urged his wife to make a final appearance as Peggy Mitchell in EastEnders, so that both Barbara and her fans could have closure with the character. In May 2016, Peggy passed away on-screen in moving scenes that reunited much of EastEnders' feuding Mitchell clan as part of a heavily-hyped special week of episodes. "Barbara contacted the executive producer, Dominic Treadwell-Collins, to make the suggestion [that Peggy be killed off] and, at first, he said, 'I can't kill an iconic character'," Scott explained. "So I went to see him and, without giving the full situation, confided that she was really struggling to learn lines and wouldn't ever be coming back again after this. "I asked that she have an autocue on set, just as a safety net. But in the end, she just used it to refresh her memory between takes. If you saw the Peggy death scenes, you could see she wasn't reading it. "Ironically, I think it's some of the best work she ever did. I was incredibly proud of her." Barbara has continued working as the disease progressed, having just finished narrating a documentary about Abbott and Costello for Radio 2 a few weeks ago. But now, her husband Scott believes it is time for her to live peacefully away from the spotlight. "So many journalists have said that Barbara has always been a good sport," he said. "She's been the subject of many scandalous stories, dusted herself off and got on with it. She accepted it was part of her job and theirs too. "So I would like to hope that the press will now show her the same respect she's shown them over the years. She deserves that." Barbara remains an icon of British entertainment, and last year was immortalised in a television biopic from the BBC in which she was portrayed by Jaime Winstone. She will be sadly missed from tv . Rebbonk but it can be cured the Curley Kale Blueberries or Wimberrys which are like Blueberries Black currents are the best Blackberries and Walnut is the trick . Broccoli is great for the thyroid if under performing which happens in older people. That diet is all useful to know Melisandre, I don't know if it has been proven or recommended by the Alzheimer's society, but it is worth a try. I love berries , and walnuts a plenty, and we eat a lot of broccoli, but I find with broccoli you have to more or less eat it on the same day or purchase as they go off quick. Cheers for that diet hint.